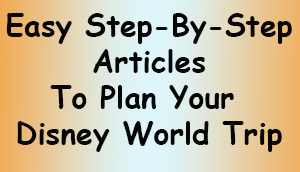 Here’s how to plan your trip to Disney World! The steps are below. First, here’s some advice. Planning a trip to Disney World may be more complicated than planning other trips. Sure you could wing it, but you’ll probably spend a lot more time waiting in lines, getting frustrated, and being turned away from things you’d really like to experience. We’ve broken down the planning process into small, bite-size steps so that you can easily plan a wonderful, smooth Disney World vacation. Start planning as early as possible, and take it a step at a time. It doesn’t have to be done all at once, so relax and enjoy planning your ideal Disney trip! Please note that we’re building this article series as we speak, and we’ll add articles regularly until this is complete, so check back. Decide whether you should you use a travel agent. Choose your number of vacation days. Book your hotel/resort or Package (includes Disney Dining Plan and buying park tickets if you’ve chosen a Disney package deal). If you have extra challenges, special needs or disabilities, please check our support articles here.